Of the International Silversmiths Group. And was introduced in 1930. The flatware is in very nice shiny condition. The back of the handles read: 1847 ROGERS BROS. The gold tint effect is from the lighting from the camera and my chandelier. This flatware collection comes in a tarnish resistant International Silver wood chest and is lined with a ink color liner. The chest shows minor storage wear. This silverware set arrives to you polished ready to serve. Here is what is included with this set. 12 luncheon, grille, viande hollow handle knives w/ stainless blades, 8 & 1/2 inches. 12 luncheon, grill, vinade forks 7 & 5/8ths inches. 12 oblong soup spoons 6 & 5/8ths inches long. 12 salad / dessert , small dinner forks 7 inches. 24 teaspoons - 6 & 1/8th inches. 1 solid serving tablespoon 8 & 1/2 inches. 1 slotted serving tablespoon 8 & 1/2 inches. 1 sugar / condiment spoon 6 inches. 1 master butter knife 6 & 3/4 inches Most of my sets are estate finds, which means previously owned (used). Although well cared for vintage treasures, I never imply brand new. I do state this set would look lovely on anyone's dining table. Some days we are very busy looking for more treasures or working, so please allow a day or two for an answer to any of your questions. 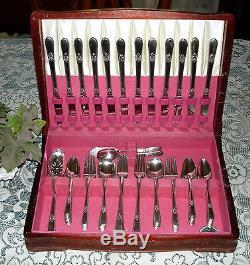 The item "1847 Rogers Bros ADORATION Flatware Set for 12 with Chest 76 pieces Nice Condition" is in sale since Tuesday, February 02, 2016. This item is in the category "Antiques\Silver\Silverplate\Flatware & Silverware". The seller is "butlerpagal" and is located in Evans City, Pennsylvania. This item can be shipped to United States, to Canada, to United Kingdom, DK, RO, SK, BG, CZ, FI, HU, LV, LT, MT, EE, to Australia, GR, PT, CY, SI, to Japan, to China, SE, KR, ID, to Taiwan, ZA, to Belgium, to France, to Hong Kong, to Ireland, to Netherlands, PL, to Spain, to Italy, to Germany, to Austria, IL, to Mexico, to New Zealand, SG, to Switzerland, NO, SA, AE, QA, KW, HR, MY, TR, BR, CL, CO.